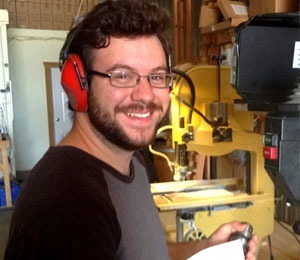 Andrew is the necessitous jack-of-all-trades component here at Tree Top Builders. His previous work experience included home remodeling, chemical manufacturing, welding, heavy equipment repair and retail. As a journeyman carpenter for Tree Top Builders, his knowledge, optimistic attitude and drive have added value to our building projects and the necessary support work that keeps us operating safely and efficiently. Andrew loves climbing trees to install cables, making sure the project site and our shop are neat and organized, and solving mechanical problems of all kinds. He is also learning more advanced carpentry and skills and tree knowledge along the way. When not putting the final touches on a treehouse, Andrew can be found in the shop constructing rope bridges, ladders, swing seats and repairing tools. It's no doubt that Andrew has a passion for the outdoors. His favorite activities include hiking, camping, canoeing, fishing, and dirt bike riding. He also has a knack for mechanical things, and in his leisure time he rebuilds jeeps, motorcycles and atv's. Consequently, His garage always has something in it that needs repair.